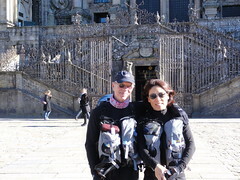 Yesterday Robin and I walked into Santiago at 1:00 PM in cold temperatures and under crystal clear skies. Our pilgrimage has been concluded. We set out from St. Jean on December 15th with a leap of faith and a step into the unknown. Now 34 (walking days) later we have completed our journey. At this point we are planning to walk out to Finisterre, another 90 Kms. If we decide to do that camino we wil leave on Monday. It seems very likely that is what we will do. I am just resting a sore left foot and Robin is still nursing her ankle, but we are still road worthy and willing to go. There will be much reflection on this trip for both Robin and I so I won’t even begin to touch on that subject at this point. Suffice it to say this camino has been so much more than I ever expected. More elaboration later. For now we are enjoying the moment and spending a lot of time at mass at the Cathedral (much to give thanks for). I also would like to post for the reccord how much it meant to me to have Robin walk all these miles with me. Her love, support, strength (she´s a walker), and navigational skills (John, I think the arrow is pointing this way) have all contributed to making this pilgrimage (with all the challenges of weather and terrain) a shared experience that will surely touch us both in ways we have yet to understand. Santiago is a place we strived hard to reach and now we are simply enjoying the sense of being home. This has been a trip where so much could have gone wrong, so many missteps could have been worse, so many hazards could have been more problematic, but they didn’t or they weren’t. Every person who sets out on a difficult journey will work out the why behind that statement for themselves. I think the time we are spending at the Cathedral tells you where we feel our thanks need to be directed. So we will close now from Santiago and start posting when we set out for Finisterre. All is well. Congratulations. It is wonderful to hear that you have arrived safely in Santiago. Good Job!!! I think this is just the beginning of yet, another chapter in your walk with the Lord and we are standing and cheering for your accomplishments, listen to the applause! I thought I had finally put the Camino behind me but reading your blog has brought back the wonderful memories and a wave of nostalgia has enveloped me on this very cold day. Thank you for the memories and congratulations! Congratulations! I hope it was all you were hoping for. And now-rest up and enjoy! When are you coming home?